This Korean Rice Bowl with Lentils and Cauliflower is da bomb! (yep, I did just say that) It explodes with flavor in your bowl and in your mouth. I’m a meat eater and I swear, you will not miss the meat in this dish! 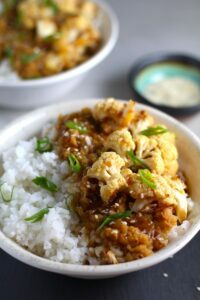 The rice soaks up the incredibly flavorful sauce from the lentils and the cauliflower which gives you a nutty and salty backdrop from the sesame oil and soy sauce, a warm and zesty kick from the ginger and garlic, and sweet notes from the honey to balance it all out. 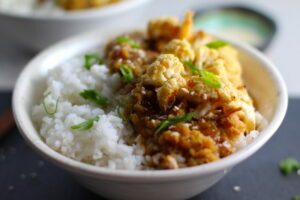 The lentils are creamy and hearty and the cauliflower gives you a nice meaty bite. Overall, the perfect rice bowl. It’s also Gluten Free, Dairy Free, and Vegetarian. Korean Rice Bowls, Meet Family. Family, Meet Korean Rice Bowls. Korean flavors generally include ginger, sesame oil and soy sauce. You may also be familiar with the popular Korean condiment/side dish Kimchi, which is salted and fermented vegetables, primarily cabbage. It is served on top of and on the side of traditional Korean dishes. However, if you are new to the world of Korean food, or just new to cooking it yourself at home, this Korean Rice Bowl is a great way to introduce it into your kitchen and perhaps to your kids. My older daughter, Daniela, loves the sweet and salty flavors. Just note that there are red pepper flakes in this recipe, so take caution to avoid them if you think it will be too spicy for the kiddos. 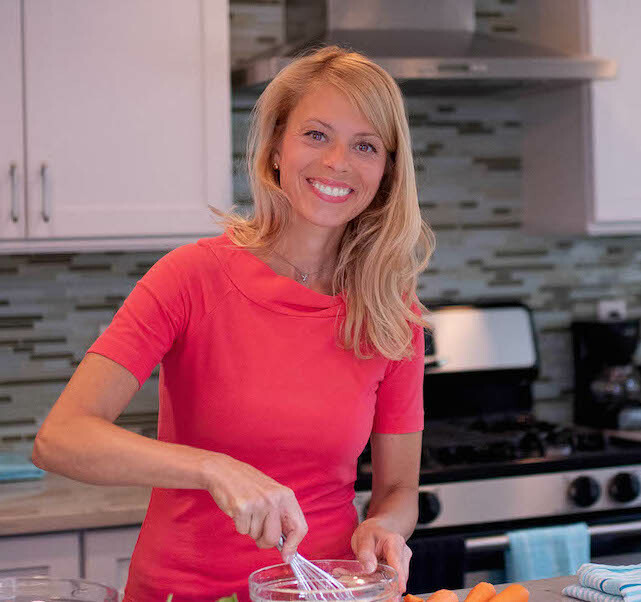 The most time consuming part of this recipe is mincing the garlic and ginger and measuring out all of the ingredients – not that this is very time-consuming or cumbersome, but it’s definitely something you can do the day or two before and every little bit helps on a busy weeknight! You will need a Large bowl for the Lentil Sauce and a Medium bowl for the Cauliflower Sauce. Then, you’ll mix all of the ingredients together and can store the bowls in the fridge so that they’re ready to cook when you are! 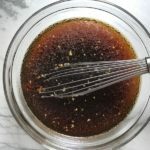 Ginger is a wonderful spice that comes from the ginger root and adds so much depth and flavor, as well as bite, zest, and warmth to this sauce. 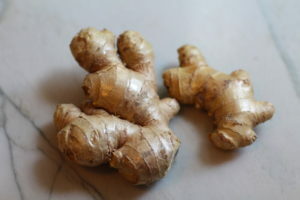 You can find fresh ginger at your local grocery store and its easy to peel the skin right off with a spoon. 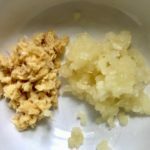 Once the skin is off, mince the ginger either using a knife or putting chunks of it into a mini food processor and blending all of it up and freezing whatever is not needed for this recipe to use at another time. Next, mince the garlic. I use the OXO Good Grips Soft-Handled Garlic Press . It seriously makes mincing garlic so easy and it’s also easy to clean and just put into the dishwasher. 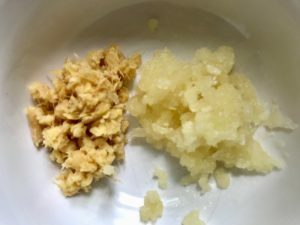 Once you have the minced ginger and garlic, you will split it between the 2 mixing bowls (details in the recipe). One bowl is for the Lentils and the other is for the Cauliflower Sauce. 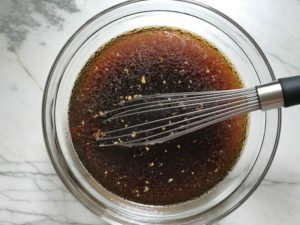 Make the sauces by mixing all ingredients in the bowls: soy sauce, sesame oil, honey, ginger, garlic, water, and red pepper flakes (optional). As I mentioned, you can store the sauces in the fridge until you are ready to cook the meal. You can also prepare the cauliflower florets by cutting them off the head and placing in a storage bag in the fridge. There are three components to this dish: Rice, Lentils, and Cauliflower. For the Rice, simply cook it as you would normally or according to package instructions. I like to use long grain white rice for this. 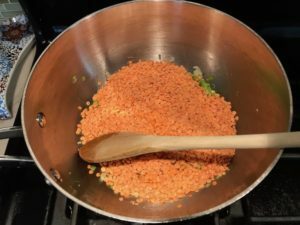 For the Lentils, you want to make sure you get the red lentils. 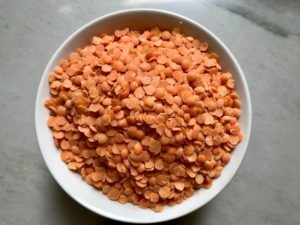 These are smaller and more delicate than other types of lentils and will cook faster and get to a softer, creamier texture than the more meaty and firm green lentils, for example. Start by cooking the scallions in a medium sauce pot for a few minutes and then adding the lentils. 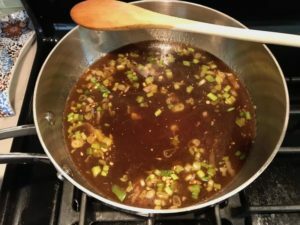 Stir to get them warmed up and incorporated with the scallions and oil and then add the sauce that you prepared in advance. Stir to combine then bring to a soft boil. Once boiling, reduce to a low simmer, cover and cook for 10-15 minutes, until most of the liquid has been absorbed. Don’t cook too long after the sauce is absorbed or you could burn the lentils. 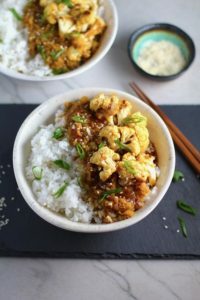 Now, for the Cauliflower, which gives you the meaty bite in this rice bowl. 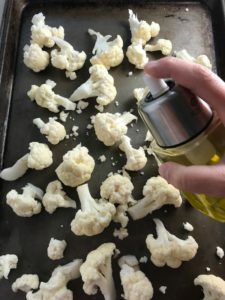 Spread the florets out on a sheet pan, drizzle or spray (I love my Sonica Organics Oil Sprayer for this) with olive oil. Season with salt and pepper and then roast in a 375 degree F oven for 25 minutes until golden brown and fork tender. The cauliflower then gets added to the sauce that you have thickened with cornstarch. Serve by first putting the rice in the bowl, then spooning the lentils over the rice, and last the cauliflower. Garnish with the green onions and sesame seeds. Enjoy! 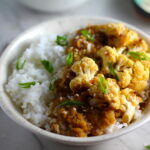 This Korean Rice Bowl with Lentils and Cauliflower is da bomb, exploding with flavor! 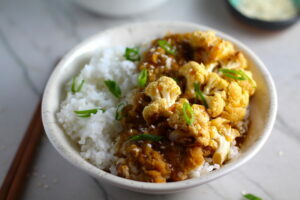 The rice soaks up the incredibly flavorful sauce from the lentils and the cauliflower which gives you a nutty and salty backdrop from the sesame oil and soy sauce, a warm and zesty kick from the ginger and garlic, and sweet notes from the honey to balance it all out. 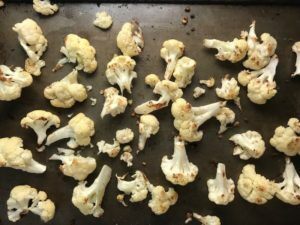 The lentils are creamy and hearty and the cauliflower gives you a nice meaty bite. Overall, the perfect rice bowl. You will be making 2 sauces, so get a large mixing bowl and a medium size bowl. Peel and Mince the ginger. To peel, you can scrape the skin off with a spoon, a peeler, or cut it off with a knife. Mince with a knife. Place 1 teaspoon of the ginger in the large bowl and another 1 teaspoon in the medium bowl. Peel and mince the garlic with a garlic press or knife. 2 Cloves will go into the large bowl and 1 clove into the medium bowl. Finely Slice the scallions. Save some of the sliced green tops in a plastic baggie for garnish. Place the rest of the sliced scallions in another baggie (or just set aside if you will cook them now) for cooking with the lentils. 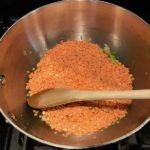 Finish preparing the Lentil Sauce in the Large Bowl by adding the rest of the ingredients in the Lentils Sauce list, EXCEPT THE LENTILS which will go in once you are ready to cook. If you are doing this a day or more ahead, store sauce covered in fridge. 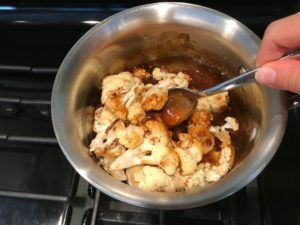 Finish preparing the Cauliflower Sauce in the Medium Bowl by adding the rest of the ingredients in the Cauliflower Sauce list: Soy sauce, Honey, Sesame Oil, 1 cup Water. If you are doing this a day or more ahead, store sauce covered in fridge. 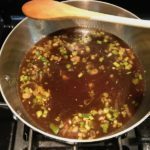 To a preheated sauce pot, add a drizzle of olive oil and the scallions and cook for a few minutes while stirring so they don't burn. Then add the lentils and stir to combine the flavors and mix with the oil. Add the sauce to the pot and bring to a soft boil. 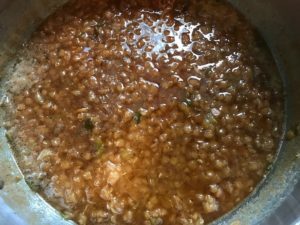 Reduce heat, cover and simmer until the lentils are cooked and tender, and most of the liquid is absorbed, about 10-15 minutes. 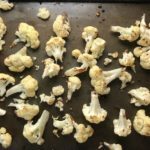 For the cauliflower, spread the florets out on a sheet pan, drizzle or spray with olive oil, then season with salt and pepper. Rub the oil and seasoning all over the florets and then spread them out again. Roast them in the 375 oven for 25 minutes until golden brown and fork tender. 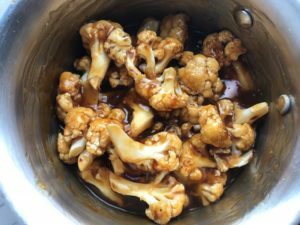 While the cauliflower is roasting, bring the cauliflower sauce up to a simmer in a small sauce pot. Make the cornstarch slurry by adding the 2 tablespoons of corn starch to the 1/4 cup cold water and mixing until it dissolves. Whisk it into the simmering sauce and then reduce the heat. Continue to whisk as the sauce thickens to ensure no clumps form, just a few minutes. 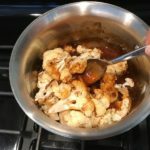 Turn off the heat and then add the roasted cauliflower to the sauce folding it in to completely coat it with the thick sauce. Carrie, I love all the flavors you have infused in this dish. It’s amazing how easy and quick this Korean Rice Bowl is. What a perfect meal for this “back to school” season. Thanks, Kristy! So happy you like it – I do too! 🙂 Have a great day!